Discussion in 'CPA/WOTC Magic Issues' started by Oversoul, Feb 26, 2018. I'll note that in that article, he cites draft experience and desire to acquire cards from older/missed sets for Modern/Legacy/Commander/Cube/etc. as the draw behind these sets. The consensus that I've seen elsewhere, or perhaps it's not a consensus but the only people who bring it up at all are the ones saying this, is that that's coded language for what everyone knows to be the real draw: EV. The higher the EV a box of a Masters set has, the better the set will do. I may be unusual in that I've liked all of these sets so far. They might not be 100% perfect, but they're just all real home runs in my book. Some of my favorite sets ever. I did think that Modern Masters 2015 was a bit of a step down compared to the original Modern Masters and I did think that Iconic Masters was a bit of a step down compared to Eternal Masters, but that's quibbling. Not everyone has felt that way. But it seems like most of the naysayers are either sore about the bait-and-switch with the hidden restocking of Eternal Masters (WotC called it a second print-run, but evidence suggested that they simply withheld part of the original print run deliberately to influence the market) or with the lower EV of Iconic Masters. I'm curious what people here think. Elsewhere, I've seen claims that they need to print these sets less frequently, that they should stop altogether, that they've run out of sets of this sort that they could make, that the packs are too expensive, that the print runs are too low, that the print runs are too high, and so on. Personally, I just think Magic needs more reprints, that these sets have been hitting far more relevant reprint needs than WotC was achieving prior to this system, and that the sets seem cool in the abstract, even though I've never drafted them and mostly play with my older versions of the same cards anyway. But I'm weird. Things are looking good so far for Masters 25. All good cards that look good. The watermark feature is a nice touch. What's not so cool is that Imperial Recruiter is a mythic rare. Without turning the whole thread into my rant about how much I despise the mythic rarity, I just want to note that bumping an uncommon up to a mythic rare is annoying. I say this as someone who already owns a full playset of Imperial Recruiter. If you're going to reprint a card that has been in desperate need of a reprint ever since 2005 (when the set it was in was suddenly made tournament-legal and demand exploded), just do it and make it count. Don't hide it at some stupid rarity where most players will never even see it. I felt the same way about Mana Drain in Iconic Masters, and a bunch of other cards too. If you want to move a card up to rare, then fine. 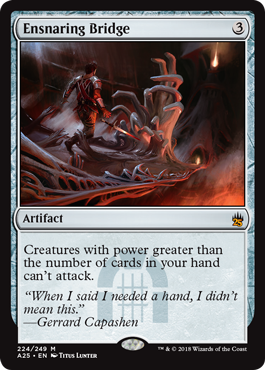 But consigning it to the mythic rarity contradicts the whole point of reprinting it in the first place. Anyway, as much as I like these sets, I worry that the best they might do is artificially put more pressure on Reserved List cards. While I was typing the previous post, they spoiled Dark Ritual. I'm sold. Maybe I missed something, but what is "EV"? Expected Value. A statistics term often applied to situations involving games. i.e. the EV of placing a bet on red on a typical Roulette wheel is -$0.053 per dollar (of course you don't lose 5.3 cents in any transaction, but that's the average "value" you get over time). MTG finance nerds try to estimate the EV of opening a box of Magic cards, and they nerd it up about that stuff. It's a misleading term when applied to cracking booster packs because it's not like you can actually truly sell the cards you opened for that much money for real. But it seems to correlate very closely with how much players perceive booster boxes to have good "value." I'm curious what people here think. Well, because you asked, but I'm indifferent. Haven't bought or got any of the previous masters, don't even play where the cards might matter so... eh. I'm philosophically in favor of reprints, I don't really care for the collectible part of the collectible card game, and want prices to be reasonable for cards. However, at this point, they've reprinted enough cards that there isn't really anything out there that would super excite me as a reprint. So I'm happy the set exists, but it doesn't really get me as excited as previous masters sets, where there were still some specific cards that I wanted the value to go down on. I have really liked all the Masters sets, and this one will be no different. I build decks by purchasing playsets, and there will be plenty of cards in 25 that find their way into my extended network of cards. New Doomsday are looks great. Rishadan Port was possibly the most needed non-Reserved reprint up to this point. More Lightning Bolt is good. I like this. This is good. I am happy with this. Don't buy Masters sets specifically or don't buy new sets at all? If you avoid Masters sets deliberately, is it because of their inflated price per pack? I think Rishadan Port was the most important one left that hadn't been touched. There's some of the Portal and Starter stuff too, kinda-sorta. Imperial Seal should be in a a reprint set at some point, and the same goes for stuff like Temporal Manipulation and Goblin Settler. Also wouldn't mind if they made a second pass at some of the "mythic" stuff already in some reprint sets. But of course, the real problem is their adherence to the Reserved List. The longer they sit on that, the more ridiculous it's becoming. Funniest reaction I've seen to this set was over at TheSource message boards: "A silver set symbol on Lightning Bolt is hate speech." 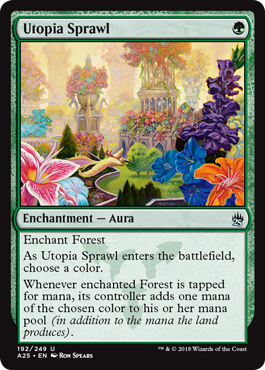 Utopia Sprawl and Ensnaring Bridge are nice to have with the new border and art. 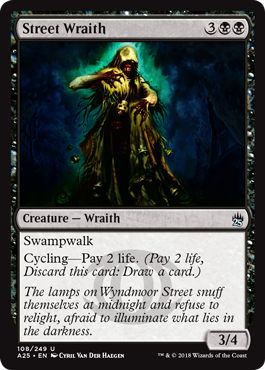 Street Wraith, Simian, and Summoner's are nice to have reprinted to control the price for widely used combo pieces. Man, I'm seeing a lot of complaints here, but most of it seems to boil down to $10 booster packs. I don't really have an answer to that one. I mean, yes, I personally consider $10 booster packs to be obnoxious. But it's not like they're going to bring the price down on these. Obviously they could. It's not like production costs are somehow higher for cards in Masters sets than for cards in other sets. And to keep emphasizing draft experience and how these sets are designed to be drafted, while simultaneously pricing most players out of ever drafting with these cards, is silly. But it's the pattern. They've done it with every Masters set. So it's not like it's a surprise. I think the set is fine, I guess I was just expecting more for the 25th Anniversary Set; except for the watermarks, it could just be a regular Masters set with a little more effort to be diverse. Yeah, same here. There's a theory, which as far as I know isn't really substantiated, that this set and Iconic Masters earlier on were going to be one set and that some corporate higher-ups instructed R&D to split it into two separate releases. So Part 1 of the project got the angels/sphinxes/demons/dragons/hydras theme and some other filler to round it out, while Part 2 was adjusted to have cards from every past set. Seems plausible, but we'll probably never know. I do think that, in the long run, the continued existence of the Reserved List would hinder these sets from accomplishing their main purpose. In the meantime, these Masters sets and other non-Standard reprint sets (Conspiracy and such) are better than the stark nothing that they replaced. So I'm hoping they last. 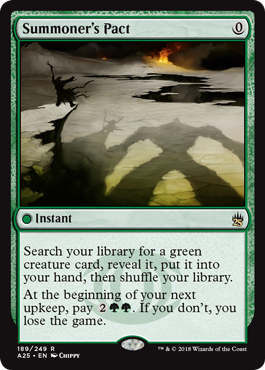 It seems like this one and Iconic Masters got more complaints, but I don't know how much that actually represents. Could be a vocal minority. It's weird. I mean, the most popular specific criticism seems to be that Tree of Redemption is a mythic. Seriously, I keep seeing that one. But I'm just like, what rarity should it be? If you think it's an unworthy card, why would you want it to take up a rare slot and see it more often? From a strict reprint/value perspective, you want the worst cards to occupy the highest rarities and the best cards to occupy the lowest rarities. Obviously sets aren't actually designed that way, but either way, I can't deduce the nature of the complaint. Well, it's official. The Masters set series is being killed off. The Game Day frame they use for the box toppers make for some very pretty cards though. I wasn't initially won over. Seeing card images on the website, the art looked almost blown up and having the art bleed into the bar at the top of the card seemed a bit much. I reasoned that perhaps it was more hastily and less thoughtfully done than the borderless Unstable basic lands. But then I was one of the many people who got one in the mail due to the Mythic Edition fiasco. Mine turned out to be a Through the Breach. And I've got to say, seeing it in person, it looks really nice. The Mana Vault art is so pretty I'd be tempted to buy one, but my Unlimited Mana Vault is already one of my favorite cards in my collection. I've been a fan of the gameday frame for a while. Closer inspection of some of the art tempered my enthusiasm though: no extended art, but blown up. Like it appeared to you. Or maybe the regular art is cropped but it is the same picture. This might be for some cards or for all, I don't know. But it is a bit of a turnoff. Still gorgeous, but still room for improvement. Having said that, this product is not for me. I don't draft, and don't speculate with boxes. While I like pretty cards, I'm not a collector (for completion's sake). They famously botched the Guilds of Ravnica Mythic Edition in the U.S. (not sure if they sold it overseas at all). To be fair, while WotC gets legitimate criticism for a lot of issues, this particular blunder may have been more of a Hasbro thing. Hasbro is trying to push their "Hasbro Toy Shop" website, but the site is ridiculously buggy and had a history of crashing when they used it to sell off some of the San Diego Comic Con promo packages. They announced the time and date that Mythic Edition would be available on the site, then their site crashed, then WotC put out an announcement on Twitter that the product was going up on the next day, and then almost right after that, the product was ostensibly available on the Toy Shop website anyway. Some people could put it in their carts but not complete their orders, some people got charged on their credit cards but got no confirmation that an order had been placed. Some people got charged multiple times. In my case, I was eventually able to place an order, but then instead of confirmation I got an error page. It took a couple of weeks, I think, but they later followed up and did eventually send me the Mythic Edition box. That launch went badly enough for enough people that WotC sent out standardized apology letters with box toppers to the people they'd been able to identify as having attempted to purchase the Mythic Edition (regardless of whether they ever got the Mythic Edition). How kind of Wizards. No, everybody outside Northern America gets the shaft, no Hasbro store here. So no Mythic edition either.